Holiday Inn Jr. postcard – 2208 Highway 71, Columbus, Texas U.S.A.
(pieshops@gmail.com Jordan Smith) on Flickr. All rights reserved. There are many versions of this postcard floating around, even multiple ones within Jordan Smith’s collection from where this one comes. Many locations used this same design but I’m not sure if that was because it was the chain’s first attempt at standardizing postcards to save money or that certain locations did not have photographs available. This one comes from a Holiday Inn Jr., a failed attempt by the company to get into lesser markets with smaller hotels. Ironically, this location is still there having been rebuilt into a Holiday Inn Express, a more recently created sub-brand that has obviously been quite successful. 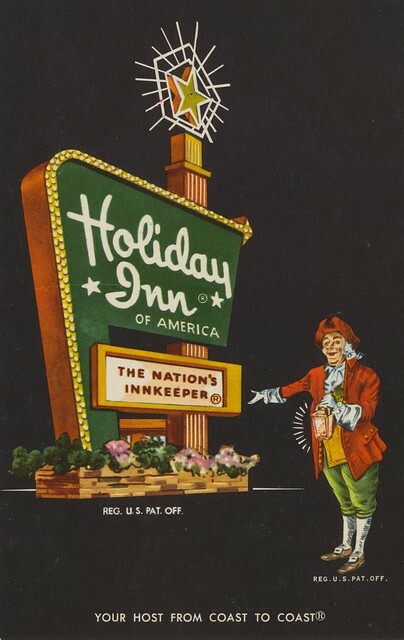 I was never big on Holiday Inn as a kid because I thought they were boring and had terrible restaurants. As an adult, I still don’t like them as I think they’re highly overpriced while being no better than similar chains. That being said, I cannot help but have a love for what was called “The Great Sign” having seen it lit up so many times at night with all of the motion around the star. On this postcard, I also love the presence of the innkeeper even though he has mostly been phased out before my first memories of traveling. Posted in Date Unknown, Retro/Vintage, TravelTagged AmericanaBookmark the permalink.